Sunny Snaps operated in a number of different locations taking walking pictures. Like Spotlight Photos, the firm is a bit of a mystery and I do not know if they were a franchise or simply a business which opened a number of different towns or suburbs on the south coast, with perhaps one processing lab covering a few locations. All Sunny Snaps cards are very distinctive, thanks to a panel at the bottom featuring the company name, often with the year the photograph was taken (and sometimes the location, though many of their cards just say “South Coast”). This panel is very distinctive and unique to Sunny Snaps. The little pen and ink sketches usually feature a London landmark and a seaside image; deckchairs, seagulls and the like. There is also space for the negative reference number to be hand-written. A lot of the Sunny Snaps cards are very good technically too (“The best all British walking picture postcard” according to their envelopes!) and this together with the nostalgic look of the designs makes them popular with collectors (and may have inspired the title of Bradford Media Museum’s exhibition of beach photography a few years ago). The oldest dated card I have seen is from 1931, the latest 1941. This suggests they set up business as the walking picture craze really took off, but struggled to carry on (as did other walking picture firms) once the war began. In 1939 the walkies were priced at just 7d each, which was lower than many walking picture firms. Perhaps this contributed to their demise. Amongst the cards, several showed the same Sunny Snaps shop in the background (see the 1936 and 1936 cards above). Research shows this to be in Worthing at the bottom end of South Street in Pavillion Parade, a large shopping block (with apartments above) built probably in the 1920s. 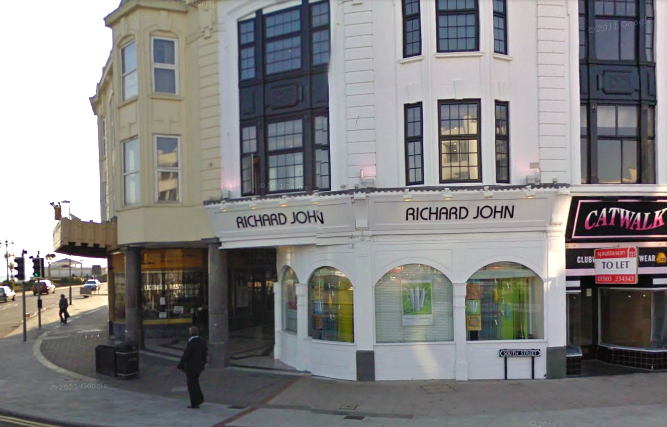 South Road met the seafront directly opposite Worthing Pier, so the shop – which was also on the corner of an arcade – was easy for everyone to find. It was run by Somers Tobacconist. I do not know if the shop had a processing operation on site or the films were taken elsewhere for developing and printing. The shop also sold films and offered a developing service for customers’ own snaps. By positioning themselves so close to the shop, cameramen would have been able to tell customers where to go to see the photographs later in the day. Sunny Snaps cameramen also operated in other streets in Worthing which have yet to be identified. The 1931 image for example shows the corner of a Kodak sign top right, so this may be another Sunny Snaps outlet. I’ve no idea where the 1935 card taken in London was snapped, though it is almost like a clandestine spy photograph. There is a large park across the road so maybe someone can work out where it is. As for the Worthing Sunny Snaps shop, in recent years the sign for the Arcade entrance has been removed, but otherwise the scene is very recognisable in this colour shot taken from roughly the same position over seventy years later. My thanks to Paul Godfrey and Colin Harding for the loan of images, others are from our own collection. If you have any cards by this firm or know more about the history do get in touch. A Sunny Snaps taken in Shoreham by The Sea is on the site. Brilliant history and information. I have few photos by Sunny Snaps of my relatives (including my grandfather, great grandafther and my great great Uncle) taking the walk with Somers Tabacconist clearly in the background. I wonder if Sunny Snaps kept all the photos they took – I wonder where they would be now. It seems talking to people who worked in the trade that photos were often only kept for a couple of weeks sometimes, then thrown away. That said, it’s possible some firms kept material for a season in the earlier days. The only example I know of anything surviving was a firm in New York, where 2 million negatives were found after they closed down. We have a photograph of my grandfather dated 1935 in London and my cousins seem to think it was taken in the Harrow Rd. Would love to post the picture but not sure how to!! Can we still send scans of Sunny Snaps to the above email? I have just been sent a Sunny Snap of my Nan which reminded me that I also had one of my Dad too. Both were taken in Canning Town London probably just prior to WW II. They both have a serial number. Is there a record of these numbers anywhere? There are no surviving records of these numbers Ann, they were only kept for a season then usually thrown away. If you were able to scan the cards for me or let me borrow them, I might be able to help date them more closely. Hi Simon, I have found a Sunny Snaps Card in my grandfather’s Album. Unlike these it was a beach shot dated 1937 and hand coloured – but whether by Sunny Snaps or later by one of the family, I don’t know. Hi Andrew, this sounds interesting. Any chance of seeing the postcard? I have a few of the hand-coloured ones but it’s always hard to tell if ordered at the time or done at home – you could buy kits of special paints to do this. I have one Sunny Snaps in my collection, a very damaged, cut card that has V.E DAY printed at the bottom. That sounds really interesting. I can see why a photographer might think of the VE day celebrations as an opportunity for a souvenir postcard print, but from the film I have seen of the day it was so chaotic, you do wonder how many people could manage to actually go and buy their card! Many Thanks Indeed. My Hobby is restoring old photographs and l have a large batch at the moment from my own family. Among them was a Sunny Snaps photo dated 1939 of my Great Aunt Anne. It’s nice to be able to find the location and add that to the information about both the company that took the photo and once restored my picture will be preserved for a s long as we carry on using computers and photographs! Quite by chance I happened to write a comment just below yours and noticed your surname. It isn’t very common as far as I know, and there are Skiltons in my family. My aunt Lily Bale married Fred Skilton in 1930, they were both Londoners. This website is absolutely fascinating! Many thanks to whoever started it and to those who contribute. I’ve taken the liberty of sharing some of the pics and info with members of “Bygone Littlehampton” quoting my source. Thanks for the link Jane, I’d be happy to add scans of any Sunny Snaps to the project. Hello. I have a 1936 Sunny Snaps photo of my relatives taken at Littlehampton that I’d be happy to email to this site. Be great to see it David, for details of how to scan see the menu on the front page header, or if you want I can scan and return. Hi Simon, I have 2 Sunny Snaps in my possession that were left in my families trust. 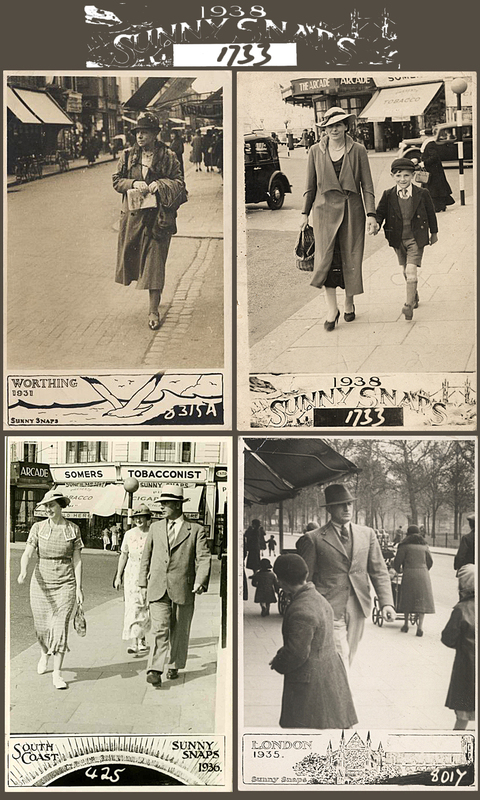 One is 1938 whereby you hav indicated Worthing Street and the tobacconist in the background. The other is 1937, and no idea where this one is. Would you mind if I send this one to you for your thoughts.